Toshiba has unveiled their first bet into the Android tablet market with the Toshiba Folio 100, a 10.1-inch NVidia Tegra 2 powered Android tablet. If you’re looking for a viable iPad alternative, the Folio 100 could be just it. What’s probably disappointing is that the Folio 100 will ship without access to the Google Market, a defect that a few cooked ROMs will no doubt rectify. In place of the lack of the official Google Market access, Toshiba has baked in Opera, Toshiba Media Player, FBReader, Fring (for video calls), Documents To Go, and Evernot. 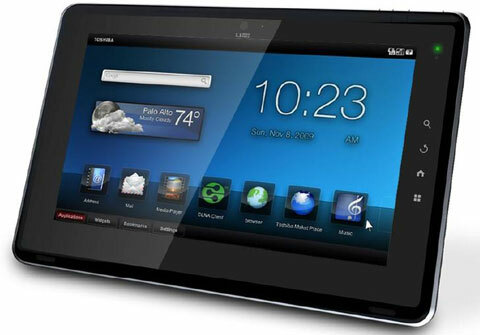 Aside from these, Toshiba also be offering its own app marketplace and developer platform for tablet-specific apps. The Folio 100 will be available in the 4th Quarter of 2010 with a suggested retail price will be €399. 5 months on and we’re still only just beginning to see any proper iPad competitors joining the fray. Apple has pretty much already got the touch screen tablet wars in the bag.